These hinges like the light green hinge in the scan above were usually made by a company called Dennison, though there were a few other makers. Usually they have a greenish tinge, are about 1/2 inch wide and 3/4 inch long. The flap that attaches to the stamp is usually quite narrow being about 5mm deep. Occasionally they are found uncoloured, being the usual yellowish or greyish white colour of glassine paper. The major characteristic of these hinges is that they peel off very easily once they are completely dry. You can take them off easily from even the most delecate of papers without a problem. You simply hold the stamp down with a pair of tongs (not sharp ones!) and peel the hinge off (if it is intact). If all you have is the flap left, as in the scan above, then you can hold the stamp down with a clean finger, and gently rub the hinge with the dull spade tips of your tongs. For this I prefer rounded tongs, just to reduce any danger of accidentally piercing the stamps. This action will cause the hinge to separate at the corners and in the middle and then you should be able to lift it off with your tongs. There should be no issues whatsoever with these types of hinges. These are very seldom seen, but when they are, they are really nasty. As you can see, they were very large hinges, as the flap of this hinge covers almost half the stamp. Rubbing and peeling probably won't work because you will damage the paper through the excessive rubbing long before you are able to remove the hinge. Part of the reason for this is that they tend to bond completely to the papeer they are attached to. A scalpel may work, but will require a great deal of patience. It may be best to leave these ones. In the above instances these stamps are printed on a soft horizontal wove paper and I could tell that there was no way to remove these without ruining two perfectly sound stamps. Place the stamp face down on a firm but soft surface where it will not slide, like the back of a stock card and hold it down close to the hinge remnant with either your index or middle finger. Holding your tongs in your right hand (use wide rounded tips for this), in the closed position, place the wide tip on the hinge remnant and press firmly down. Then keeping the pressure on, begin moving the tongs in a circular motion. Move in very small, controlled and tight circles. If your movements are uncontrolled or too wide, you will suddenly crease or tear the stamp. After a about 30 seconds or a minute you should see the parts of the hinge remnant begin to loosen. Then you can get your tongs underneath it or otherwise begin breaking it off. Once a portion has completely loosened, simply peel it off. Watch very carefully to ensure that the hinge has comletely detached before removing it, as you can still thin the stamp at this point. Thanks very much for this. I will have to try it. Oh yes, I should also mention that it's imperative to NOT use the brush that accompanies the Stamplift in this case. It puts on far too much, and it will 'DE-gum' a large area of the stamp not intended to be so. In the case of used stamps, the toothpick (Again, WOODEN and NOT Plastic toothpick)works great but a bit of patience is required. As far as the soaking of ANY stamps goes, I'm really against it, period. 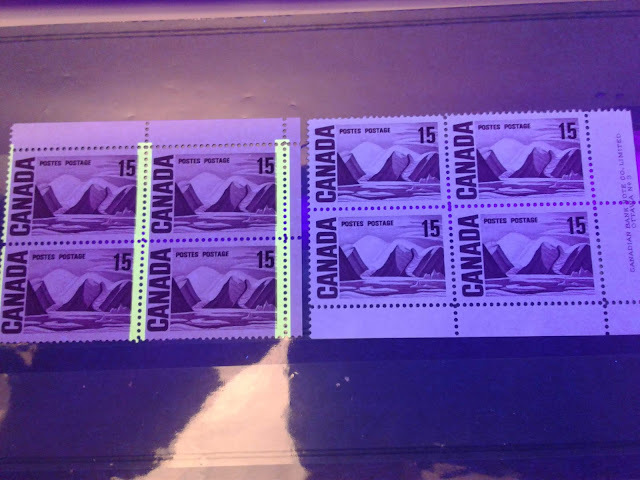 Being a Super-Specialized collector also of the Machin Head series of Great Britain(And there are indeed THOUSANDS of varieties of them), I've found that soaking the stamps affects the Coating, the Fluorescence, the Phosphorescence, the Paper, and even the perforations to some degree as well. This I mention because this holds true for Canada stamps as well in most cases. Of course, the toothpick method is NOT necessary for removing them from piece, and the brush will work just dandy, that is to say if a LITTLE Stamplift is applied to the Stamplift brush. After all, these aren't Cornish Game Hens we're basting here! Thanks for the detailed tips. I will definitely have to try them.